Guest Post by Rob Parker. Rob is a civil engineer with over 30 years experience in both design and engineering construction of dams, freeways, water treatment and general infrastructure. More recently, when confronted by the environmental impacts of our patterns of consumption and growth, he decided to look at ways to influence our political policies. Its turned out to be much harder than first thought. He was a candidate for the NSW Labour Party in the State seat of Goulburn before realising the massive difficulties in getting the ALP to address climate change in a meaningful way. Rob lives in the NSW village of Berrima and campaigns on rational ways to address climate change. The passion and guts displayed on Friday by Dr. Bradley Smith in Brisbane was a great demonstration of what happens when people of knowledge and courage are repressed. He grabbed Gillard’s limelight and shone it on the real issue of the need for urgent action on climate change. Through the political haze of Abbot’s denial, Gillard’s gormlessness and the Green’s pursuit of failure we need some hardnosed clarity. On the 15th August supporters of real action on climate change have the chance to demonstrate our conviction that Nuclear Power is uniquely placed to mitigate climate change. 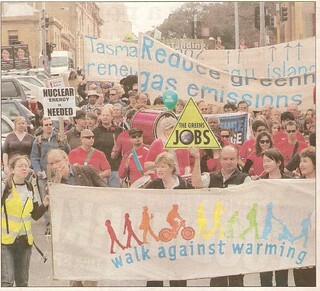 Last year I went to the walk in Wollongong with the smiley face “Nuclear Power – Yes Please” poster. I certainly got some responses – some angry, some very welcoming and others just perplexed. My motivation is always to defeat climate change and educate my fellow Australian’s into the best way of achieving that goal. This year, in line with the plans for action contained in the Brave New Climate post of the 21st June, we can do a whole lot more. 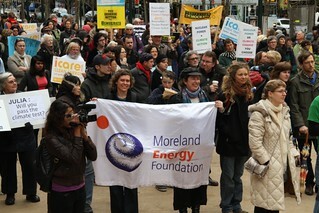 The Sydney event will be held on the Sunday at 12 noon at Belmore Park opposite Central railway. Come along with your own poster and tees shirt. The Environmentalists For Nuclear Energy (EFN) tee shirt can be purchased from the Pistol Clothing Company in Sydney. 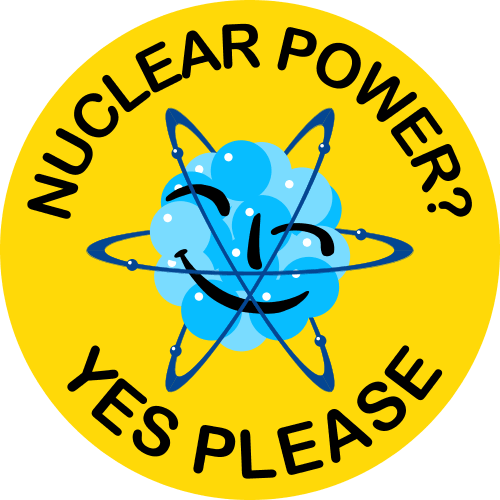 I’m getting some T-shirts printed with the Smiley Face “Nuclear Power? – Yes Please” as well. In Sydney I would really like to link up with any other NSW based BNC readers to make this a big day. I’ve contacted Richard McNealI at EFN so that we can have a combined group and meet with them just before the walk starts at say 11.45am. I’m suggesting we meet first at the south western corner of Belmore Park. If you can come along then let me know by emailing here. But please, this is not just about a Sydney event. Brave New Climate readers are Australia wide so even if you’re on your own or in a group, get your tee’s and posters ready and remember – have fun and be kind to each other! Together we must defeat the forces that are preventing “Real Action on Climate Change”. I would walk but it is going to be to hot In Knoxville, Tennessee, so I will ride in my air conditioned Honda instead. The global climate appears to be cooling – from my own observations and anecdotal evidence from around the world. But nuclear power is definitely a good thing that we need more of. Bill: have you read the NOAA reports on 2010 average climate (land and sea surface temps)? June (going on memory) was 1.93 degrees F above the norm. July doesn’t look to be cooler. 2010 is so far the hottest year in the instrumental record, as Hansen predicted in his 2009 book [uncertainties were connected to the sloshings of the El Nino/La Nina]. why should a climate scientist like Barry accept “your observations” and “anecdotal evidence” over NOAA? anecdotally (meaningless but two can play that game), we on the east coast of the u.s. are experiencing a heat wave where a heat index over 100 has been far more common than days in the upper eighties (normal). The evenings in the last couple of months have rarely dipped below 70 F. Evenings have been especially hot, as predicted. Bill, that’s a good thing about replacing environmentally damaging fossil fuels with nuclear power — there are multiple reasons to pursue this, whether it’s due to concern about climate impacts, or air and water pollution, or considerations of energy security and economics, or just because you love the high tech, high energy density properties of nuclear fission. Nuclear power — the great energy unifier! Rob,thanks for the single sentence summing up of the current political situation in Australia. Which way to vote on August 21 ? Damned if we do and damned if we don’t. 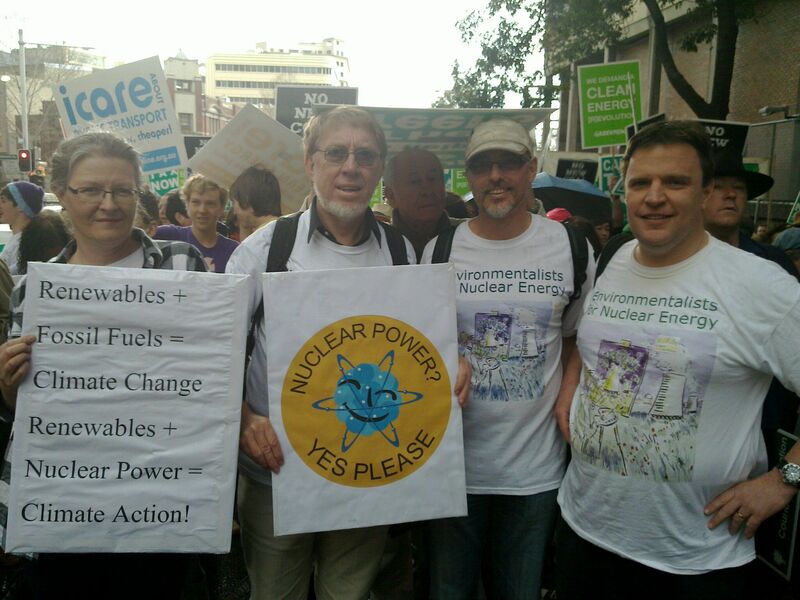 I have done a Walk Against Warming a couple of years ago.I may take part in the Brisbane one this year and if I can rustle up a pro nuclear poster it would make it more worthwhile. 3) if it’s not Australia’s problem then whose is it? If anything street marches are too polite. I think the way ahead is to ridicule the ditherers, perhaps by repeatedly pointing out their shallow priorities. Rob, would love to be there, in my best fission fetishist fashion. Have emailed you. I’ll be walking in Melbourne. Would love to have have some fellow travelers. Anyone else from around Melbourne going? John N, what’s to say you can’t make a placard out of one of your three points? The problem with sticking to the net is unless you can make something ‘go viral’ then people generally only find what they go looking for. We need the NP message to reach a broader audience and an event like this is one way we can achieve that. Besides, an NP banner in the middle of what the mainstream would consider a ‘green’ march may just be enough to get some extra media attention. There would surely also be opportunity for some face to face discussion. Whether it is the recent El Nino’s lighter winds reducing east coast sea levels and/or the cooling oceans, my long established sea benchmark is showing a decided drop in king tide levels compared with 47 years ago. The highest astronomical tide this winter [when the sun and moon were in line–recall the solar eclipse at Easter Is. recently] registered 40 cms lower than 1963. If we were getting SLR due to AGW that would not be happening. However, I too agree that Nuclear power is the logical way. They have quite a few rather… interesting policies, and I don’t really mean that in a good way. Try carefully reading all their policy statements. I’m in Melbourne too, and I’m sure I could probably meet you at the event. I wonder if anyone else is interested? What do you think of the idea of making a Brave New Climate Facebook group? That would be great Luke. We’ll have to organise a place to meet. My email is timaz@gcom.net.au . Anyone else wanting to come along is welcome to email me too. When we were building igloos for Al Gore in Washington, D.C. last winter it was “weather” rather than “global cooling”. Now that it is very hot in the same place it is “global warming”! Give me a break and Bill Old too! The real global warming is so minute that it takes a bus load of statisticians and “Climate Scientists” to quantify it. if you read my post, it is OBVIOUS that I get your point about weather. (I noted my anecdote about hot weather was meaningless; I was merely parrying Old’s anecdotal cooling ). hot weather in a given place means no more than cold weather in another place. on the other hand, extraordinary heat waves are of significance (see barry’s point about australia’s heat wave a year or two back). as are average global temperatures. the june heat anomaly for land was 1.93 degrees F. not so minute. I shall be joining the march in Briz Vegas if there is one. Btw Barry, talking about T-shirts, did you ever receive the one I forwarded to you , at Adelaide Uni ? greg, there are better things to do with my time than engage with unpersuadables like Anthony Watts. yeah, I can see your point barry. saw it before I posted in fact. But there’s a good deal of wattism here at BNC. plus, I bet watt is pro nuclear. Barry, could you be a bit more specific? Or do you feel that this is achievable too? Mea culpa. You do understand the distinction between weather and climate. spangled drongo, they are Rob Parker’s words, not mine, so I’ll leave him to explain it to you. This was a guest post. But yes, I do think it’s achievable to convince Australians of the need to seriously pursue nuclear power, which will be the most meaningful way to tackle climate change, by a long way. Sorry, Barry, but you are still “tackling climate change” when surely you mean that anthropogenic bit. [and as you know I do support your great NP effort]. Would you consider this Wattism? I like their tax policy, it is a very morally principled position. I suspect however that Australians want their government a bit more evil when it comes to tax. I guess in the struggle for relevance some senior scientists don’t have many options; either become a GW denier or start wearing a bow tie. July should finish as an interesting month with low rainfall and warm temperatures well outside winter norms. The long awaited Olympic Dam announcement hasn’t materialised. the world is a complicated place: a number of leftists think climate change is a middle class movement to rip off the third world, prevent development etc. left wing versions of Bjorn Lomborg. see michel chossudovsky or david noble. not to mention alexander cockburn. by and large, this is the dominant trend in the movement. Bill Old – thanks for the laugh! 2010 is on track for the hottest year on record and 1998 – that old denialist chetnut is now in 4th place for the current heat record. Wonder what made it hotter 100 years ago? And don’t forget to give us your unadjusted data for 2010’s HYOR. There’s plenty to suggest that it isn’t. Climate change is real,always has been, always will be but whether we are the current cause is still debatable. That’s why so many reputable scientists, climatologists etc are questioning it. It might be worth considering whether or not the Medieval Warm Period was in fact a global phenomenon. If it were found to be such, then the basis of present science stating that industrial-era carbon emissions are the dominant cause of today’s warming would be significantly undermined. Some research is being carried out starting about 10 years ago by Karin Holmgren of Stockholm University, Sweden and examining Cold Air Cave stalagmites in northern South Africa which has suggested that a temperature reduction of about 1 degree is evident for the Little Ice Age followed by a 700year stretch of time corresponding to the MWP which contains perhaps 8 approximately 100 year long cycles which show temperature similar to or greater than those of the past century. The authors postulate these centennial cycles are driven by variations attributable to the sun. Further research at other sites, especially in the Southern Hemisphere would be useful in establishing whether or not the GWP was a global phenomenon and not just a regional [northern hemisphere one] as stated by phil Jones. If future research shows that the GWP was in fact global, then AGW really does become seriously compromised. Anyway, this would be something worth pursuing in the interest of getting the ‘Science in.” But, you know what, I don’t really care whether or not we are the problem and we may never really know. What I do know is, that there are serious other anthropogenic effects which we have wrought upon our planet. We’ve overcleared our land and over-committed our water here in Australia. One thing we can do, without an ETS, CPRS is to help correct our water and energy problems by developing the only alternative to coal for base load power and that’s nuclear power. Finally, whether or not coal burning is producing “dangerous global warming” We need to stop burning the confounded stuff for power because the toxic muck which spews out of the power stations has killed millions since the beginning of the Industrial Revolution and even today, kills 24,000 Americans alone every year. That needs to stop. We need a secure energy supply and without greenhouse gases. For both of these, there is ONLY ONE OPTION.viz. NUCLEAR. FYI the Brisbane venue has been changed from Queens Park to King George Square due to a “huge response” as per email from QCC. I hope the “huge response” bit is true. There’s plenty to suggest that it isn’t. Climate change is real,always has been, always will be but whether we are the current cause is still debatable. That’s why so many reputable scientists, climatologists etc are questioning it. Oh really? Where are they then? And most importantly where are their publications in the relevant fields? What do you get when you put 100 climate scientists in a room? In every specialist field in science, technology, engineering and medicine we place far more weight on the opinion of experts in their field than others with scientific education or professional scientific standing. So how come climate science should suddenly assume a unique status where every opinion is equally valid. Science is not a democracy. Furthermore every national science academy, scientific society and professional body of international standing that has issued a public position asserts the reality of AGW. None – that is not one – dispute it. BTW, we can add the CSIRO and the BOM to that list as well. Your claim is unsupportable in the face of the facts. b) can be measured with thermometers. Thanks Quokka and John Newlands. It seems there are 3% who will never be convinced about AGW. John, what if the MWP IS proven to be true? Research is proceeding I believe on that score. Quokka, I checked the blog you suggested. There seemed to be a few who were not convinced about AGW unless I misread it. Sorry to be so bloody-minded but I’m staying in the “denier” camp for the time being. I accept climate change is happening and that so is warming. I don’t accept that we are the cause. What I do know is that we have to stop burning coal for power and replace it with nuclear. That’s where I’m concentrating my efforts. Could I suggest that you make up your minds about what we need to do for our secure emissions-free future energy and start badgering our leaders and the people to do something soon. The best evidence currently is that during the MWP the average global temperature was not higher than today. Specific regions exhibited higher temperatures possibly some as high as today, but importantly many of these are separated in time – by as much as centuries. A very good source for this sort of stuff is NOAA Paleoclimatology Reconstructions Network which contains a daunting amount of material including published papers and the raw datasets which anybody can freely access. On the front page is a chart showing a number of temperature reconstructions from proxy records. (Reproduced I think, from IPCC AR4). The general hockey stick appearance is very much in evidence. As the raw proxy data is freely available, one would think that after years of whinging some contrarians have published some serious alternate reconstructions showing the hockey stick to be in error. So far we have not seem them. The contrarians focus on Mann 1998 and like to pretend that nothing much has happened since then. In fact, as is clearly evident from the NOAA resource, a lot of work has been done by multiple teams using different proxies and different statistical techniques and the hockey stick remains intact. Of course is possible than new work with a different proxy series may throw new light and throw doubt on the currently accepted wisdom. Such things are always possible. But whether a single proxy series on one continent will destroy the hockey stick seems unlikely. Only time will tell. I would point out that this type of argument is rife in the denial blogosphere, where some allegedly shattering piece of new research in just one paper is about to destroy the foundations of climate science. The outcome is almost always far more mundane. In any case, even if there was an MWP that was warmer than today, it would very soon lose that distinction. CO2 is still a greenhouse gas, the planet still has a radiative imbalance and those thermometers (and satellites) are still recording increasingly higher temperatures. I fully agree with the rapid deployment of NPPs and look forward to Gen IV, but I remain unconvinced that of itself it will be sufficient. Coal fired electricity production is responsible for probably less than 25% of the world’s CO2 emissions. It’s surely got to go, but on present indications, it’s replacement is going to be far too slow. And even complete replacement of coal by NPPs still may not be sufficient. While deployment of NPPs is very likely the single most important step that can be taken to mitigate GHGs emissions, I think we also need a carbon price (though not necessarily an ETS). Hansen is right about this. I can’t see how this in any way impedes the introduction of nuclear power. On a political note, I can’t see the introduction of nuclear power into Australia while the Greens remain unified in their opposition. It’s not easy, but changing some minds in that area really would facilitate progress. At the risk of labouring the hockey stick issue, it should also be pointed out that the current rate of warming is “unprecedented” regardless of any purported MWP. On the second climate change thread I posted a link to a report of a new paper in Nature that estimates that there has been 40% decline in phytoplankton in the world’s oceans over the last 100 years and that decline is continuing at 1% per year. It is attributed to a slower turnover of the surface layer of the ocean causing fewer nutrients to be brought to the surface. This increased “layering” is due to the rate of temperature change not just the absolute temperature. If this estimated decrease in phytoplankton turns out to be supported by further research, then it is extremely serious. Not only does most other life in the oceans depend on phytoplankton at the base of the food web, but phytoplankton are the biggest biological carbon sink on the planet. At face value, it looks like a catastrophe in the making. And it seems the rate of change of climate is the cause. Barry, you’ve got right of veto over this, its your blog. Thanks again Quokka-very helpful comments. I’ve just been reading lots of stuff from the “deniers” Gee it’s hard for an ordinary bloke like me to sort it all out but I’ll keep trying. But an overseas poll revealing a majority now feel that man is not the cause is a worry. I don’t think we are ever going to get agreement on this and so as I noted earlier, we have to do something urgently about getting more clean power as soon as we can and nuclear has to be a big part of that. China know that and are building 24 reactors as I write. We have to get our pollies to take nuclear on board and not get hung up on the inadequate renewables and yet to be developed technologies. We haven’t got time if the warmists are right. I can’t speak for Barry, but the card design looks great to me. Maybe You could have had some background graphic. Is there anything on the other side John? FYI the free business cards came from http://www.vistaprint.com.au if anyone else would like to do something similar ever. @Mark I arranged some time ago to walk about 10km along Adamsfield Track on Sunday. Christine Milne asserts that Tassie is now on 48% brown coal power via the underwater cable. That’s from 0% in 2006. If true it seems HVDC doesn’t encourage renewable energy, it helps displace it. That seems a truly extraordinary figure. I’d love to know how she came up with it. Sen. Milne did say that 48% was for summer only. It also appears that Hydro may have conveniently omitted electricity imports in claiming low CO2 from generation within the State. I see Sen. Milne’s website features a solar tower. She wants loan guarantees (same as US nuclear), feed-in tariffs and carbon pricing. Three bites at the cherry. The tone seems to be with a bit of tinkering those pesky coal stations can be quickly sidelined. I fear the Walk Against Warming will be effectively hijacked by the Greens Party who would have the public believe all the participants are supporters. It would take a brave soul to hold aloft a pro-nuclear placard. I fear the Walk Against Warming will be effectively hijacked by the Greens Party who would have the public believe all the participants are supporters. Exactly. My main point in being there would be to ensure that the contrary point is made. It would take a brave soul to hold aloft a pro-nuclear placard. We’ll see, if my nerve holds. If I survive (;-)) I’ll let you know how I go. Mark Duffett – hope you get some support in Hobart. Well – just back (alive) from the Melbourne WAW – we got a photo taken, by a osound bite with one of the Melbourne TV stations. There is np guarantee that they will use any of this of course – but – fingers crossed! Sorry – overexcited :) …got a photo taken, by a newspaper photographer, of our group holding up “Nuclear” posters, and a short interview/soundbite with one of the Melbourne TV stations…..
Well, that was an interesting experience. I had one person thought I was the devil incarnate and talked a blue streak of antinuke talking points at me for five minutes without drawing breath (starting with Russian fires), another guy who was quite supportive and wanted to know what kind of reactors we were pushing, others who asked for pamphlets and information, so it was great to have the pamphlets and the cards, and another guy who was anti but did have an open mind and I had quite a long and pleasant chat with him. It was great to meet Rob and Anne, and Richard McNeall. I also had a friend Nick from work and his family, and my father happened to be in Sydney this weekend so he did a good job bothering people and handing out cards. Some observations: most people reacted well, or at least politely when we offered cards and pamphlets. I’ll tune the message some more, I think the ‘Renewable power does not work’ line was a bit strong for this crowd. The cards and pamphlets were really useful materials to have. We had EFN T-shirts, and a couple of placards. More would have been better. A number of people knew about the ZCA2020 plan and it certainly gave total cover for their rejection of the nuclear option. Anyway, definitely worth doing, and we should do it again next year, with more people. I should add, bicycle boy (the antinuke above) thought my promoting nukes was extremely dangerous and irresponsible because it would force a delay to implementing the ultimate renewable solution. Exactly what I thought of his position. Yes, I too survived. 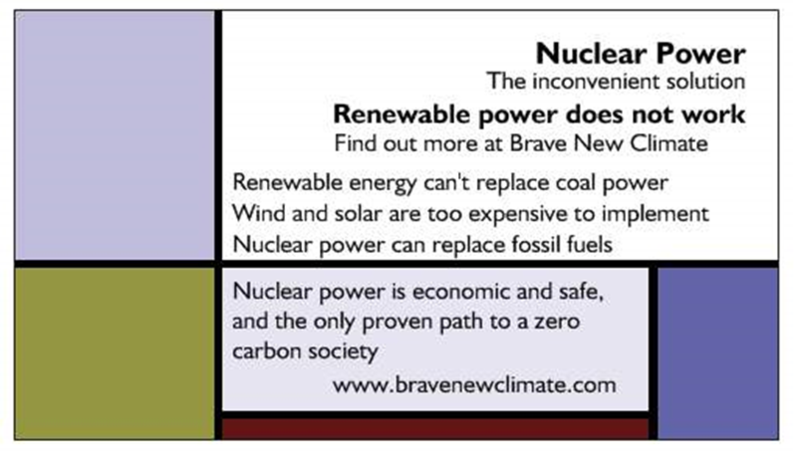 My ‘NUCLEAR ENERGY is NEEDED’ placard drew a few critical comments, but it also appeared quite prominently on the news of both local commercial TV stations. This probably had a bit to do with managing to get a good position near the front of the march, though local ABC news managed to keep me out with some judicious editing. At least most of the critical commenters also took one of the pamphlets, in addition to several people who bowled up and asked for one. The nearest I got to unpleasantness was a chap who kept getting into my personal space in rather childishly (in spite of being 60-odd) trying to interpose his poster between mine and the TV cameras. Afterwards I got a pamphlet into the hands of local lower house Greens candidates Wendy Heatley (Franklin) and Geoff Couser (Denison), as well as Senator Christine Milne, in the course of short conversations with all three. Of these, I was most impressed with Geoff Couser, in that he was the most open-minded. He all but admitted the inadequacy of renewables with a comment along the lines of ‘renewables would be up to the task if they’d had the same amount of intellectual and financial capital invested as nuclear’. Of course, that’s as may be, but it doesn’t alter the current situation. Unfortunately Couser is only the roughest of chances to be elected, whereas Milne is a shoo-in. And while the likes of Milne hold sway in the Greens, there will be no change in their nuclear policy. That lady is not for turning, to coin a phrase. The irony of her predilection for decrying ‘old thinking’ and ‘ignoring the science’ in the major parties is completely lost on her. Well done John Morgan and Mark Duffett. Your crowds were more responsive than the Melbourne bunch. Only a couple were prepared to listen and take the brochures. Handing out the cards was a good idea – next year we will have some printed. No coverage that I could find in the SMH. The total crowd at the walk struck me as not huge. I fear climate change has died as an issue now it seems to be completely off the political agenda. Any pictures of the event? Scott, some pics of the Hobart event can be seen on Tasmanian Times. The photographer (a professional Wilderness Society activist) has been careful to exclude my contribution, except in the last photo where he’s zoomed out just far enough to make my placard (black on white, just left of centre to the right of the postbox) illegible (with the eye of faith you might just be able to make out the word ‘NUCLEAR’ at the top). Lesson learned: next time, make a bigger placard. Well at least you made the newspaper:) Don’t know what happened to the photos we saw being taken by telephoto lenses. I don’t know how big your sign was but I took mine to Officeworks and got it blown up to A2 and laminated. The black and white version only cost a total of $8.95 but the coloured one was much more – about $17. I’m not sure if they can make bigger versions than A2. Richard MacNeal took a pic of us in Sydney, I’ll see if I can get it. Thank you for the summary. And really well done you guys. My eyes are watering as I write this. To their credit, the organisers of the Melbourne WAW have put up a photo with our little band of pro-nuclear climate activists featuring quite prominently. Regarding placard size. I agree. Next year they’ll be bigger. @Ms Perps, I should clarify that Tasmanian Times isn’t a newspaper, rather an independent media website. I’m not sure if it got in the Hobart Mercury – like you, I don’t read the local paper all that often! Thanks Marion for sourcing the photo for us. The posters were A2 size – I agree they need to be at least twice as big next year. 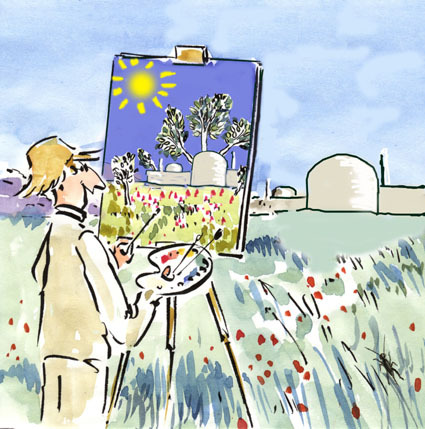 “nuclear energy, no thanks!”, a duplicate of the one you promote today, in their efforts to ban nuclear energy. riots and wild demonstrations took place then!!! Interesting, isn’t it, as is interesting the way you demonstrated against French nuclear tests in Mururoa, 5000 kms from Australian coasts ! @John, yep, that’s me! You can see the price I paid for my plum position was having those bloody loud drums in my ear (they were good, though). Where did this photo come from? Left to right are Anne Parker, Rob Parker, myself, and Richard MacNeal of EFN. Mark my neighbours kept yesterday’s paper knowing that I am pro-nuclear despite PV, biodiesel and wood fired cooking. Somehow it got scanned and uploaded to Flickr which I guess is a violation of copyright. I was out bush on Sunday and noticed only one person was holding the fort at the logging protest camp (‘Flozza’, now snowbound) so I guess the others were in the WAW. Well there you go, Ms Perps, I made the newspaper after all (page 5 of Monday’s Mercury). Thanks John. There wasn’t any mention on the Mercury’s website, so I’d assumed it wasn’t in the dead tree version either. Unbelievable. After putting my photo up on flickr for about an hour, the Nature Conservation Council have obviously just looked at it, and deleted it! Is it really that unbelievable, John? Great work by you & Rob in Syd, and Mark in Tas, and Marion and co. in Melb. Excellent and fearless efforts! this reinforces my now strongly held belief that most of what is being advocated by the eco-warriers is more about a religion and pushing left wing political agendas than about trying to find viable solutions. No Barry, I’m just indulging my outrage. Now I’m feeling guilty about not going on the ACT walk. I was thinking about it, but I still have some mobility issues. Anyway, good show. These kinds of events can provide pro-nukes with a vehicle for publicity until we’re in a position to arrange our own events as well. Congrats to all you walkers,card hander outers etc. That’s a good start and we all need to keep these things going. It’s easy for me to say that living as I do over here on the edge of the universe. I’ll just keep badgering politicians and writing to papers. I think there’ll be a piece by me in the Sept Adelaide Review for anyone here in SA who may be interested.